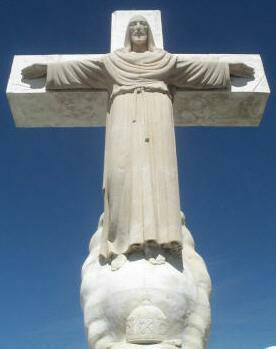 Standing atop the Sierra de Cristo Rey (Formerly known as the Cerro de los Muleros, Mule Drivers Mountain), in Sunland Park, New Mexico, the 29 ft. tall limestone statue of Christ serves as a shrine to thousands of faithful in the El Paso and Southern New Mexico area. Dedicated in 1940, this monument to Christ was the vision of Fr. Lourdes Costa, a local parish priest, who in 1933 after looking out the back window of his residence in the community of Smeltertown, envisioned erecting a monument at the summit of this glorious mountain. With no knowledge of who owned the mountain or whether it was located in Texas, New Mexico or Mexico, Fr. Costa and sixteen others made the arduous trek on October 28, 1933. In church the following day, Costa preached to the congregation sharing his vision of a cross on the mountaintop. Together, they pledged to erect a temporary wooden cross and to later replace it with a monumental one. Additionally, they promised to volunteer their time and efforts to make the mountain suitable for ascension. On October 31, Father Costa presented his idea to Bishop A.J. Schuler of El Paso, who approved. Eventually, learning that the area is in present day Sunland Park, NM, almost 200 acres were purchased from the Commissioner of Lands of New Mexico by the Diocese of El Paso. On the eve of lent, February 13, 1934, men carrying material on their shoulders and braving the hazardous climb over dangerous slopes placed the first cross. At sunset Father Costa blessed the twelve foot high wooden cross. The first step of one mans dream had been taken. The work did not stop there. Having vowed to replace the temporary wooden cross, students at the Smelter Vocational School were working on an iron cross. While that was going on, men, women and children were all working, no less than three times a week for almost five years to help make the priest's dream a reality. Hundreds of people labored long and hard to build the two and one half mile road to make the future statue accessible. With the foundation built and the construction of the iron cross complete, on Palm Sunday a second procession was made, placing the larger and wider cross. It was blessed on March 25, 1934. On August 31, 1937, Father Costa met with Bishop Schuler to suggest that his good friend, world famous sculptor Urbici Soler, be commissioned to construct the monument. Costa discussed the project with Soler, who was in Mexico City for an exhibition of his work. Bishop Schuler, having agreed to commission Soler, sent him money for his initial expenses. He arrived in El Paso on October 4, 1937. While Costa devoted his time to financing the project, Soler was studying the site and making models of prospective ideas. A clay model made by Soler of his concept of the project was approved on December 7, 1937. Soler left for Austin on April 1, 1938 to select almost forty tons of the finest limestone from their famous quarries. He cut and shaped the large stones himself as he prepared them for shipping. He began the trip back to El Paso in September. Upon his return, work began in earnest. The base of the monument measures 14 feet wide and ten feet high. It was made to hold six inch by four inch memorial tile plaques made of Spanish Talavera with the names of contributors and sold for $25.00 each. The base was completed on May 15, 1939. The first stone of the limestone statue was placed on May 24, 1939 by Urbici Soler. From then on, until its completion, he was on the scaffold from 4:00 AM to sunset everyday. The statue was ready in time for pilgrimage on October 29, 1939. The crown that encircles the base of the monument was constructed and completed to coincide with the fiftieth anniversary on October 29, 1989. For more information on upcoming events and dates when you can visit Mt. Cristo Rey, please call us at (915) 252-9840. Visitors are urged to contact the Restoration Committee or the Sunland Park Police Department prior to attempting to climb Mt. Cristo Rey. Due to the proximity of Mexico on the Southern edge of the mountain, visitors are cautioned not climb alone and always go in groups. Vandalism, assaults and robberies are still an ongoing problem and visitors are encouraged to visit on days when organized events are being held and security is on site. Please visit the events page to get dates of upcoming events.